I will always have a reason to stash small pieces of leftover fabrics and I believe my excuses are truly valid. I use leftovers for linings, for contrast trims, for covering buttons, for bows or any other detail I can think of. Possibly not everyone in our family shares this love, but I love going trough my bits and pieces. 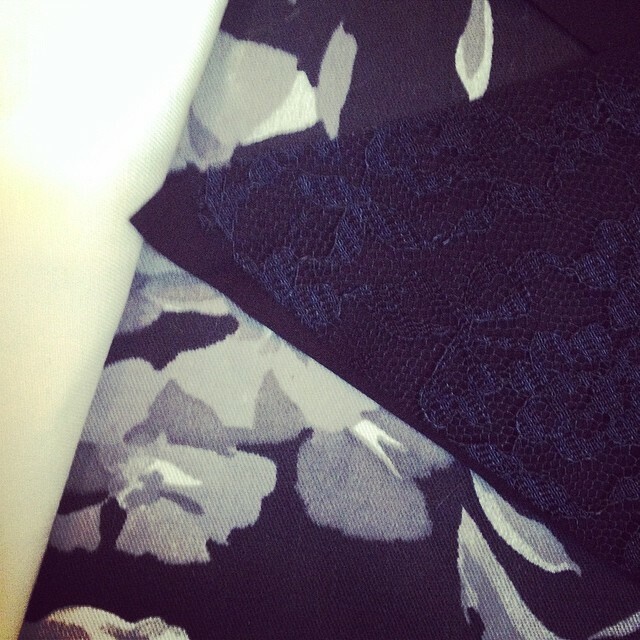 My new pencil skirt is about mixing and matching fabrics within the same colour range. I used this black and white cotton flower print, mixed with some leftover uni cotton for the waistband and lace to make this design. At the waistband I sewed on two strokes of a vintage lace ribbon which I found at the fleamarket of ‘Porte de Clignancourt’ years ago. You see, eventually everything will get its purpose! 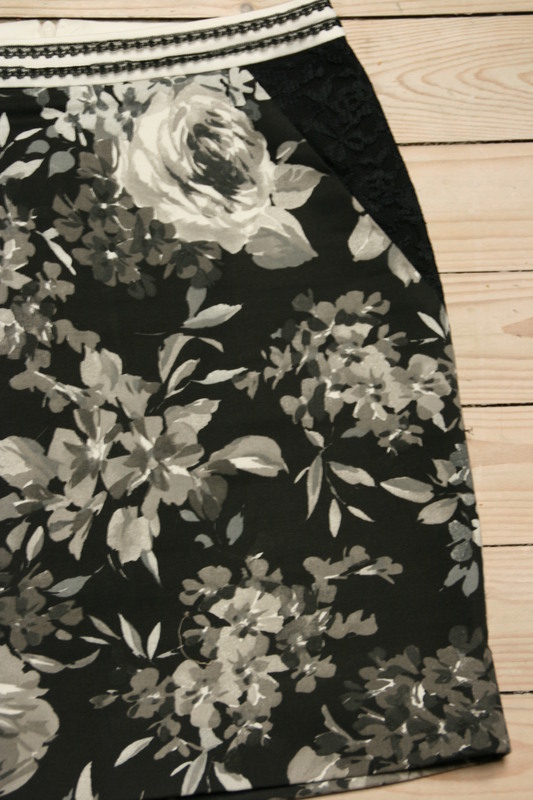 Easy pattern DIY: For this skirt I made a slant cutting into a basic skirt pattern . That’s it! This is the pattern for the bodice of the dress. I used the following measurements for this pattern: Chest width: 62cm – Waist: 56cm – Shoulder to waist: 24,5cm – Armhole: 11,5cm – Neckopening: 14cm – drop by 5,5cm. This is for a size 3/4 years old. I add 1cm of seam allowance and 3cm at the center back with buttons. I copy the pattern for the facing and lining. This is my magic bucket of fabric leftover. I found this nice red cotton for the lining, a perfect match! So this is how it all comes together. I draw chalk lines for the skirt of the dress: 2 pieces of 33cm (includes seam allowance 1+3cm) and all that is left of the fabric width. I draw another chalk line at 7cm to make the fancy trim at center front seam. The trim is finished at one side with a roll seam of 0,5cm. I use my iron to make pleats. All pieces are sewn together, the outer shell and the facing/lining exept for the center front. I pin the trim on one side of the bodice and close the center front. Now I fix pleats in opposite direction with a top stitching. I close the neckline of both layers. I close armholes of both layers on front and repeat this for the back. I stitch from the inside, not as shown here! For the skirt a close side seams (not the center back) and gather the pieces for the skirt to match the width of the bodice. For this particular fabric I’m using pleats again instead of a gathering. I attach the skirt onto the bodice outer shell. Then I fix the inner shell by stitching from the outside on the seam between skirt and bodice. (to hide inner seam) I’m closing the lower part of the skirt at center back and finish the hem. Finally I’m adding buttons and buttonholes at center back. I love to stroll around on markets, always in search of vintage belts, purses and gloves. Last week I found this lovely leather skirt in superb condition. The seller, a very proud lady, said she used to wear this and maintained it with leather grease as she saw me looking at it and touching the leather. I just couldn’t resist to buy it and because she was so persistent about the good quality I couldn’t haggle either. She’s probably very good at selling her things… Anyway, a leather mini was still missing in my wardrobe! Determine the desired length and add 3cm seam allowance. Use chalk to mark where to cut. Fix the hem with Pattex. Maybe leather glue would have been better but this worked really well. Don’t overdo it though. Fold over the seam allowance and press well to get a nice clean seam. I could have stopped here and that would have been great too but I decided to add something extra. Why not use the hem leftovers? I already promised this a few weeks ago on my Facebook page and finally here it is: the basic pencil skirt pattern. This is a must have to make most skirt designs and absolutely easy to make. A rectangle will form the basis again for this easy pattern, based on the measurements of my hips , I add darts at the waist et voila: skirt finished! I had to make some adjustments after sewing the first skirt because it was too wide at the waist. Once the fitting is perfect, I can try out new skirt lengths, asymmetric hems, add seams or create different volumes. I hope to show you some interesting modifications very soon but for now I enjoy the simple cut of this basic pencil skirt. Zoals ik al een paar weken geleden beloofde op mijn Facebook pagina is het nu eindelijk daar: het basis kokerrok patroon. Dit patroon is onmisbaar als basis voor de meeste rokontwerpen en absoluut éénvoudig. Een rechthoek zal opnieuw de basis vormen van dit eenvoudig patroontje gebaseerd op de omtrek van mijn heupen , daarna wat nepen toevoegen in de taille en voila, rokje klaar! Ik geef toe dat ik het patroon wat moest aanpassen want het was me ietwat te breed. Eens ik de perfecte pasvorm heb kan ik spelen met roklengtes, asymmetrische zomen, naden toevoegen en andere volumes creëren. Alles is mogelijk en ik hoop jullie snel een aantal interessante varianten te tonen maar nu geniet ik van de eenvoudige snit van deze basis kokerrok. 1) Maak 2 rechthoeken op breedte B (heupen): 1ste rechthoek=een halve voorzijde + 2de rechthoek= een halve rug. Ga vanaf lijn A naar onder met lengte C om de heuplijn B te bepalen. 2) Add darts and curve the side seams to shape the waist A. 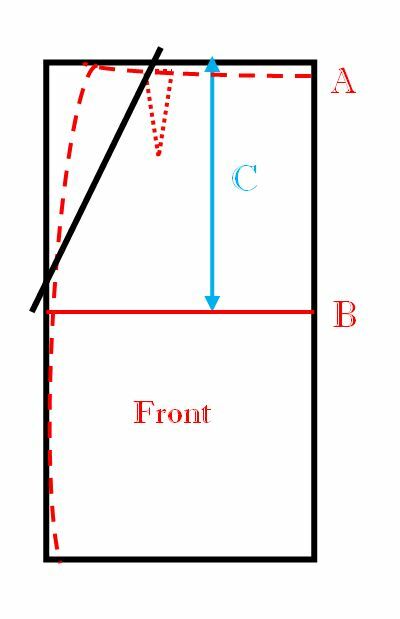 The difference between hips (B) and waist (A) will determine the width of the darts, darts are longer and wider at the back. (later on I changed the pattern and used 2 darts at the back because the difference between my waist and hips was too big) Dropp the waist A by 1cm at the center front and 0.5cm at the back, create a curve for a more natural waistline. 2) Voeg neepjes toe en rond de zijnaad af om zo een taille te vormen. Het verschil tussen heupen (A) en taille (B) zal de breedte van de nepen bepalen, nepen zijn dieper en breder op de rug. (ik heb nadien het patron aangepast en 2 nepen gebruikt omdat het verschil tussen mijn heupen en taille te groot was) Ga 1cm naar beneden op middenvoor A en 0,5cm op middenrug A. Voor een meer natuurlijke belijning in de taille krijgt lijn A een zachte ronding. 3) Choose a good length for your skirt. (measure from waist A down). 4) Ad seam allowance, 4cm for the hem and 1cm for all other seams. No seam allowance at center front, the pattern is placed at the fabric fold. 4) Voeg naadwaarde toe, 1cm voor alle naden en 4cm voor de zoom. Er is geen naadwaarde nodig op midden voorpand, het patroondeel wordt tot tegen de stofvouw gelegd. 5) Make a facing for the waist by copying the waistline A and go down by 8cm. Close the darts with tape and make a soft curvy line. Add 1cm seam allowance. 5) Maak een beleg voor de taille door het patroon te kopiëren vanaf de taille A tot 8cm naar onder. Kleef de nepen dicht met papiertape en herteken tot een zachte afgeronde vorm. Voeg 1cm naadwaarde toe. The pattern is finished, now you can start sewing. The back will need a zipper and you can find a lot of great blogs on how to do this. I advise you to finish al seams with a zigzag before stitching the skirt. * I’m still looking for good tutorials on invisible zippers, let me know if you have a good one!